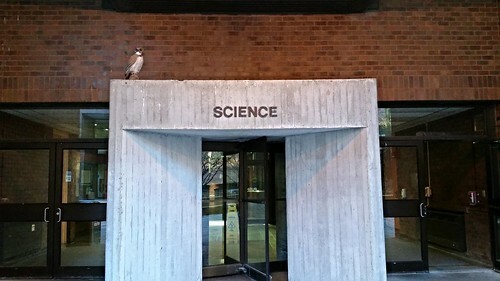 The entrance to the science building at University of Massachusetts, Boston with a wooden owl standing upon the entrance. Leave it to the science building to have a wooden owl scarecrow watching over all who enters. I am assuming the owl is there to scare away critters and smaller birds from hanging out in the area. Though I find it equally symbolic to have an owl standing at the entrance to a science building, hinting at knowledge to be acquired inside these doors--acting as a guardian of sorts. I didn't have the time (because people kept coming in and out of the building), but I would have liked to square this photo off a bit more. The light gray center with the own atop it is a nice contrast and form with relation to the brick-background. I would have stepped back even further to capture the catwalk above the entrance because the symmetry and lines of it all were well laid out. The owl's presence adds an interesting accent to it all--like reintroducing nature to a place after it has been utterly removed.